The holiday season can be a difficult time for senior citizens if they are unable to take part in the festivities. However, there are plenty of things that family caregivers in Rhode Island can do with their senior loved ones to share in the spirit of the season. 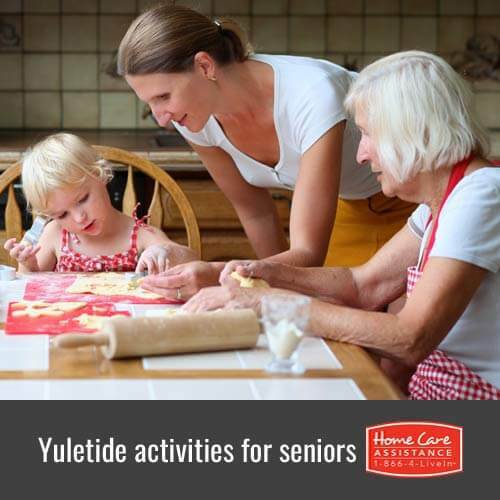 To help your loved one indulge in the holiday spirit this Christmas, try one or all of these fun yuletide activities. This is an activity that can be done while seated, which makes it a perfect option for wheelchair-bound seniors to celebrate the season. Once the cookies have been baked into Christmas-themed shapes, put out a spread on the table and use colored icing and sprinkles to make beautiful cookies for Santa (or your neighbors). This project will promote creativity and foster communication between older and younger members of the family. Young and old family members can appreciate a theatrical reading of a classic Christmas story. The senior loved one in your life can be the reader, or he or she can simply listen. Recommended books include How the Grinch Stole Christmas, The Night Before Christmas, and The Polar Express. Try reading a new one each time, or read the chapters of a longer book like Charles Dickens’ A Christmas Carol or Louisa May Alcott’s Little Women. Feel free to have a book-club style discussion afterwards for some mental stimulation. Movies are fun for people of all ages. There are plenty of film options to entertain Grandma, Grandpa, and the kids this Christmas. Consider It’s a Wonderful Life, Babes in Toyland, Elf or Miracle on 34th Street for some classic options. Share some heartwarming laughter and merriment during the movie, and then discuss the film together for some cognitive exercise. Pile everyone into the car together, pack some hot chocolate and marshmallows, and go look at Christmas lights in the neighborhood with the most elaborate decorations. This is a special way to enjoy some time together that is easily done regardless of limited mobility. This will foster happy memories and promote overall emotional wellbeing for your senior loved one. With so many fun and easy activities available, there is no reason for seniors to feel neglected or lonely this holiday season. To give a generous gift to your loved one this holiday season, reach out to Rhode Island Home Care Assistance. Our compassionate caregivers will ensure your loved one can enjoy the winter festivities in the comfort of home while receiving quality care assistance, such as housekeeping and emotional support. Call a friendly Care Manager today at (401) 284-0979 to schedule a no-obligation consultation.